A man wakes up on the shore, his memory gone. Later, he finds out that, not only is he immortal, he may also be the legendary hero, Heracles. To ascertain whether he truly is the Heracles of legend or if the nymphs who gave him this information were playing a devious trick, the supposed Heracles heads to Mount Olympus, home of the gods. 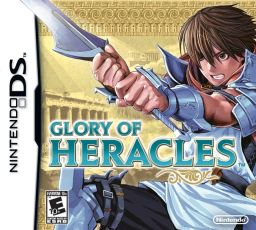 This is the premise of the DS game The Glory of Heracles, the first game in its series to see an international release. The game’s story is far from a landmark for video games. For the most part, the game is populated with a generic cast of RPG characters. There’s the silent hero, the Adonis-esque bishounen, the muscle-bound man who cannot take anything seriously, and the uncharacteristically mature little girl. To make matters even worse, The Glory of Heracles takes abusing the amnesia cliche to new heights. Your entire party will wind up consisting of amnesiacs. Despite the uninspired cast of characters, the plot still manages to be interesting and it does house a fair amount of intriguing twists and surprises to keep things interesting. Graphically, The Glory of Heracles will not attract any glances. The characters and enemies are slightly pixilated and the various cities and towns you visit on your journey offer little to no variation in terms of design. All the buildings seem to have the same architecture from Athens to Troy. On the plus side, the animation runs fluidly. Also, the animations for magic spells and skills are very impressive. It is always pleasing to see the enemy ranks being bombarded with explosions, getting encased in ice, or bashed with gigantic, magic swords. Glory of Heracles doesn’t push any technical boundaries, but it is easy on the eyes. There is precious little to say about the music in The Glory of Heracles. The background tunes do not stand out much, but neither are they hard on the ears. The main theme, however, is quite catchy. One of the most interesting aspects of the games is its unique “ether” system. In addition to depleting an individual character’s MP, magic spells also deplete a universal store of substance called ether. Ether is divided into five categories: four elements (Fire, Earth, Air, and Water) and Dark. Using an elemental spell depletes ether of its respective element while adding to the pool of Dark ether. Similarly, using Dark spells depletes Dark ether while adding to the elemental ethers. If your character casts a spell without sufficient ether to satisfy it, he or she will take damage equal to the deficit. The game warns you that the ether is insufficient before you order your character to cast the spell, but does not take into account that enemy spells will deplete ether as well, so your character may yet take damage from casting it. But this happens rarely and is usually of little consequence when it does, so do not let it worry you. More ether can be generated by dealing extra damage to an already defeated foe, a mechanic called Overkill. Aside from its spell system, the strategy in The Glory of Heracles is relatively simple. Battles consist of casting spells and executing skills like in any other RPG. Due to the fact that most of the enemies you encounter are rather weak, the game does not house a lot of challenge. That being said, bosses and a couple of slightly-less-than-common enemies help to make the game at least a bit threatening. These bosses and enemies have unique quirks and abilities that make their confrontations epic or just annoyingly difficult (for example, one boss is a sphinx that turns your cast magic against you). To aid you in your quest, you have the choice to boost you magic and skills by playing touch screen-based minigames. Though some prove monotonous after awhile, the bonus damage they provide in battle is indispensable. These minigames may be tedious, but can raise your magic’s power to devastating levels once you’ve mastered them. Dungeons and the overworld are sadly streamlined in their design. On the overworld, your destination is clearly marked by a flag on the map on the top screen, but there is little chance for exploration anyway. Dungeons are dull and linear. They are painfully straightforward and the puzzles held in a few of them are easily solved. In fact, they can be reduced to little more than a get-to-the-basement,-killing- enemies-in-your-way-and-defeat-the-boss affair. Enemy encounters are annoyingly frequent in both dungeons and the overworld. This is even more frustrating in the latter, where your movement is sluggishly slow, making your journey from A to B quite tedious. Fortunately, you can purchase monster repellent to make encounters occur much less often. Overall, The Glory of Heracles is a solid turn-based RPG. It is not flashy or mediocre, which means it is best bought at a reduced price. But if and when you buy the game, it is rewarding to play through it to the end. It has a decent story and gameplay, with average music and graphics. But once you get past its faults, you have a simple game that is an excellent pleaser, especially for Greek mythology buffs, like myself. Do not expect The Glory of Heracles to be a masterpiece, for doing so will give it an undeservedly ill-favored disposition in your eyes. Though it is no masterpiece, The Glory of Heracles makes a heroic endeavor to be one, and it does not fail miserably at it either. For the first time, our Games of the Past Review for Glory of Heracles features a second opinion! Check out what Editor Jeff Neuenschwander had to say here.